This our most decadent and over-indulgent service for couples. Well that is if you think close to two and a half hours of pampering is decadent and over-indulgent! For some it is a need. What makes this massage Deluxe? Your appointment time is scheduled for two and a half hours, giving you plenty of time to change, relax, sip a cup of tea, enjoy delicious cookies, soak your feet, all the while reconnecting with the special someone joining you. Then retreat to separate treatment rooms for your 90 minute massage based on a Swedish massage technique (specialized techniques, and special attention for problem areas can be incorporated) with a bonus of special pampering for your hands and feet in the form of organic Shea Butter and warm towels restoring moisture and making them buttery soft. To finish at least 20 minutes following your massage to use our deluxe jetted shower, relax further in our relaxation room with more tea or water, change and slowly return to the rest of the world relaxed and calm. This is way more than a massage, it is a complete pampering experience. Why separate treatment rooms? In our combined years of experience we have found that everyone likes the idea of having a “couples” massage in the same room. People think it is going to be romantic, sensual, perfect. But that is in theory. In practice, the room is crowded, no one seems to relax, a therapist talking to one client (even in hushed tones) about issues interrupt client two, and if you aren’t romantically involved with the other person having a massage being in the same room can be down right uncomfortable. 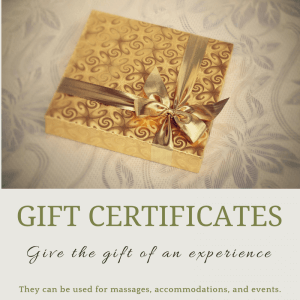 By having the massages in separate rooms, everyone is more relaxed and enjoys their massage plus you have the time before and after the massage to connect with your special someone. 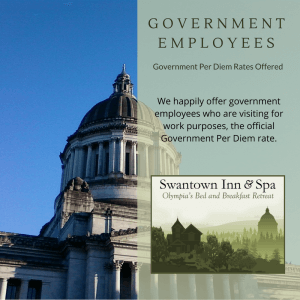 If you are staying the night at the Swantown Inn & Spa, where we are located, you receive a credit on day spa services. Note that you must book the service in advance to be sure of service availability. We have increased the credit, for this service only, to $100. Having a hard time justifying the cost? Another local spa offers a 50 minute service that includes a full body massage, foot cream, light back exfoliation and warm towels. 50 minutes? How much massage are you actually getting? And the cost? $70 per person, $140 per couple, and less than an hour and again in separate rooms, no together time. Our treatment if we decided to cram it into 50 minutes, would be $65 per person, but why would you want to cram all this luxury and pampering into 50 minutes? Plus our pricing now includes gratuity! No math skills needed.